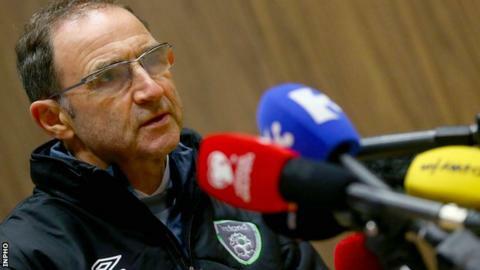 Martin O'Neill remains upbeat about the Republic of Ireland booking a place at the Euro 2016 finals despite injuries and suspensions derailing his plans. O'Neill takes his team to Bosnia on Friday in a first-leg play-off ahead of the return leg in Dublin on Monday. John O'Shea and Jon Walters are suspended for the first leg with Shane Long a major injury doubt. "We've got ourselves into this position and we don't want to throw it away lightly," said the Republic manager. O'Shea, 34, is banned for Friday's first leg in Zenica and may miss the second leg with a hamstring injury. Long, who has a foot injury, stays in Martin O'Neill's squad which was reduced to 30 on Sunday evening. Injured duo Shay Given and David McGoldrick are among nine men to drop out from the original extended squad. O'Neill's side beat world champions Germany last month to keep their qualification hopes alive, and he wants them to make sure they are still in the tie when they return to Dublin for the second leg amid public pessimism surrounding his weakened squad. "I don't think the players will be swayed by that," he said. "They will feel after Germany that they are capable of getting a result. "Make no mistake about it, the games will be difficult, but you wouldn't be expecting any sort of walk-over in play-off games. "We have to stay overnight because we can't get back here to Dublin on the Friday, so we stay on Saturday, get back and get ourselves prepared for the second game. "But there's no point in preparing for the second game if you haven't done the preparation for the first one. "The momentum swinging towards them [Bosnia] doesn't bother me, it genuinely doesn't bother me." Ireland secured their place in the shoot-out by finishing third in Group D behind the Germans and Poland, edging out Scotland in the process. "We have earned the right to be there, particularly with our results against the world champions, and we have accumulated the points," O'Neill said. "I think if you had mentioned to me a way back when the group was first introduced that we would have a home and away match in the play-offs to try to qualify regardless of who was available for us at the time, I probably would have taken that."